What a great year for BYU sports! 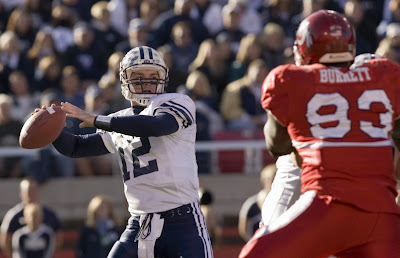 First the football team wins the conference title and ends the regular season by defeating the Utes in their own stadium when senior QB John Beck threw a game-winning, desperation touchdown pass as the game clock expired to senior TE Jonny Harline who was wide-open in the end zone. Next BYU traveled to the Las Vegas bowl to hand Oregon a decisive 38-8 loss just one day after Ducks head coach Mike Bellotti had talked smack about BYU being a "mediocre" team. This also marked BYU's first bowl win since 1996. Then basketball season began. My brother Ryan and I were at the Huntsman Center to watch BYU beat Utah on the road for the first time in 13 years. Just a few days ago the women's team beat Utah at home to clinch the women's conference title. And today the BYU men's team played their second game against Utah; this time at home. Five minutes before game time I realized that Krista had dressed our little cougarette in Ute red. So, I quickly took Ava upstairs and dressed her in Cougar blue (sorry, no pictures). I also taught her the BYU fight song (she's having trouble with the words, but seems to like the hand motions at the end). I believe her display of Cougar pride proved to be a good luck charm as the Cougars went on to slaughter Utah 85-62, clinching the conference title outright for the first time in 19 years. It also extended BYU's home winning streak (currently the nation's longest) to 31 games. 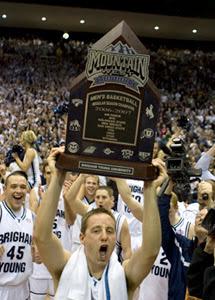 And this marks the first time in 27 years that BYU has won the conference championship in both football and basketball in the same year. This week we'll be taking our little cougarette down to Las Vegas to cheer on the Cougars in the Mountain West Championship tournament. Oh, and for those who mainly visit this blog to see pictures of Ava (which we realize is pretty much all of you); don't worry, more Ava pictures are coming.